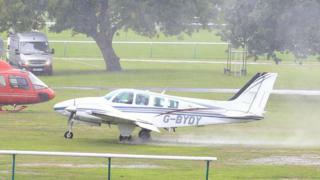 A pilot has been praised for doing an "amazing job" regaining control of a light aircraft that apparently skidded on landing at Haydock Park racecourse. Anna Lisa Balding was on the plane and said the weather had been "bad". Mrs Balding said it was "absolutely terrifying", adding: "How we didn't get killed was unbelievable." "Our pilot did an amazing job," she added. "I don't know what happened, but I do know I saw my own life slip away from me very quickly, but we're all alive and safe." Kirkland Tellwright, clerk of the course, said: "The bigger plane coming in skidded on landing, apparently spun and clipped the smaller plane. "No-one was hurt, but neither plane will be flying today."